We are proud to use our collective power to negotiate and partner with our signatory contractors to provide the best member benefits in the building and construction trades. Together, we enhance worker skills, promote workplace safety and job and career opportunities for a diverse workforce. LIUNA members earn a fair return on work, family-supporting wages, affordable healthcare and retirement security, so we can provide for and have time to spend with our families. Courses are conducted in our beautiful 44,000 square foot facility in Lino Lakes, Minnesota. The training center consists of classrooms, meeting rooms, a welding area, three 6,000 square foot hands-on training bays and administrative offices. Our instructors are highly qualified and certified to offer a full range of course. Our facility is recognized as an authorized provider of industry specific courses by the Asbestos Abatement Unit of the Minnesota Department of Health, the Environmental Protection Agency, and the Occupational Safety and Health Administration. Our facilities’ enrollment capacity permits up to 150 trainees per week in various construction, environmental and safety skills courses. We offer this training as a benefit to LIUNA members and signatory contractors. Our goal is to create opportunities by educating and training skilled Construction Craft Laborers. Plan ahead to register for training early. Click here for more LIUNA Training Center information, including course descriptions and the 2018 training schedule. 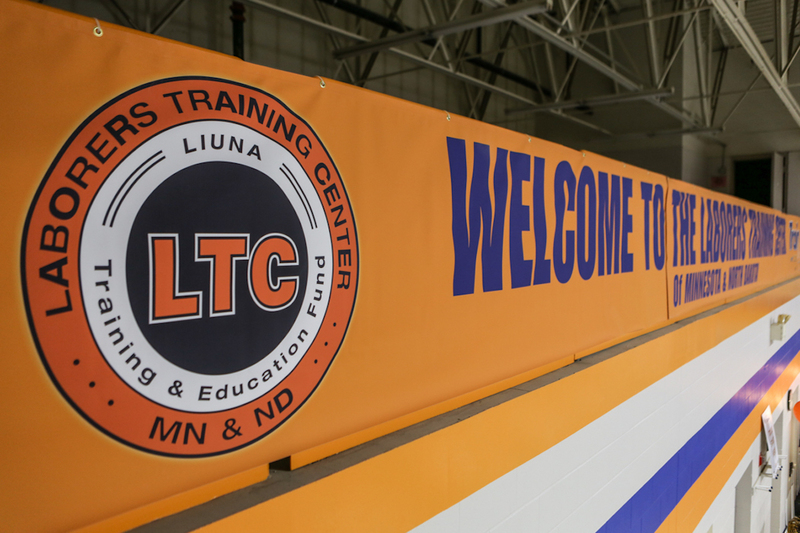 For more information, including course descriptions and training schedules, please visit www.ltcmn.org or contact the LIUNA Training Center at 651-653-6710/888-758-6466 or the Apprenticeship phone at 651-762-8235. LIUNA members value our freedom. Real freedom is about more than making a living; it's about having time to take a loved one to the doctor, attend a conference at our kids' school and retire in dignity. We are proud to use our collective power to negotiate a fair return on work and protect things our families need, like family-supporting wages, affordable healthcare, and retirement security. Standing together, we must protect our freedom to join together in union and fight for our freedom to prosper. Everyone deserves to work in a safe environment. For LIUNA members, ensuring that you work on safe jobsites and that you and your family have the best health care possible have always been key concerns for your union. Safe and healthy worksites reduce injuries and illness and prevent accidental deaths, benefitting both labor and management. Strong health programs help you and your family live better lives. To achieve these goals, LIUNA and our signatory contractors established the Laborers Health and Safety Fund of North America (LHSFNA). For more information about LIUNA Minnesota & North Dakota’s wage, healthcare and retirement benefits, please contact Zenith Administrators at 651-256-1800/800-814-4240 or [email protected]. LIUNA Minnesota & North Dakota is proud to partner with our signatory contractors to win projects and jobs via the Minnesota Laborers-Employers Cooperation & Education Trust (LECET). LECET works not only to keep LIUNA members working, but to increase market share and make LIUNA contractors’ and owners’ first choice. LECET builds relationships with contractors, owners, developers, and users of construction services. They monitor upcoming projects and jobs, highlight the advantage of utilizing LIUNA members, work to ensure fair contracting, promote the use of “best value” contracting, and help LIUNA members and their employers win work. Click this link to Minnesota LECET’s website and check out LECET’s quarterly newsletters: www.mnlecet.org. For more information, contact Dwight Engen, Construction Market Director, at 651-429-1600 or [email protected].